ReDigi offers its service as a modern-day equivalent of a used record store. EMI says the analogy is inapplicable because "used record stores do not make copies to fill their shelves". Instead it alleges that the service is a clearinghouse for copyright infringement. ReDigi says its service does not infringe copyright because it is protected by the fair use and first sale doctrines. EMI says it owns the "exclusive rights" to manufacture, reproduce, distribute and sell digital versions of the copyrighted works of its artists. It notes that authorised services including Apple's iTunes and Amazon's MP3 store had to sign agreements with it. iTunes's rules state that users must comply with "the applicable usage rules established by Apple and its licensors, and that any other use of the iTunes Products may constitute a copyright infringement". ReDigi says that EMI's distribution rights are limited to material objects, and if digital files are judged to be material objects it can invoke the first sale doctrine which permits resales. EMI says ReDigi also offer 30 second clips of songs which are stored in users' "memory banks" which it claims is another unauthorised copying act. ReDigi says the songs are only loaded into a computer's RAM memory so that they "disappear" after the track has stopped playing. EMI says that given the widespread piracy of sound recordings it is "questionable" where ReDigi can effectively determine if the files were obtained legally in the first place. ReDigi says that the only eligible files are ones originally downloaded from iTunes and that it excludes tracks ripped from CDs or taken from other stores, allowing it to use software to validate ownership. EMI notes that ReDigi has acknowledged that there is no way to ensure that users do not retain copies of the files they upload. 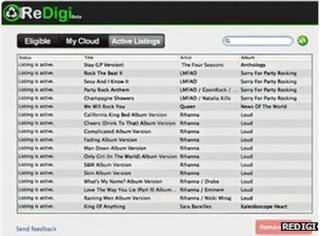 ReDigi says its software is designed to run "continuously" in the background to detect songs on any device attached to the user's computers at a later date. It says if they refuse to delete the files their ReDigi account is suspended.